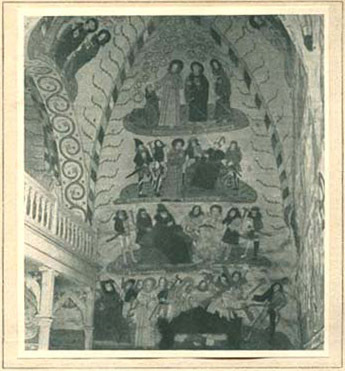 These murals are a close copy of those found in Ireland and Scotland and came to be used in a Christian church, such as the one in question, rather belatedly. The images were transmitted through Gotland, with inhabitants of which the populace of Finland had come into contact since the times of antiquity" (page 32). Judging by the illustrations contained in the brochure of Mr. Nervander the frescoes of Nousiainen were reminiscent of the northern rock carvings and images in the Hallristningaz. They are suggestive of the boundary between Cappella Palatina and the Chudsky Figures – the time when Christianity had landed its weighty hand upon the sacred shamanism. One needs to agree with Mr. Nervander that such décor in a Christian church is indeed quite remarkable. What a striking impression must have been experienced by a viewer contemplating that tall and spacious church, with white walls, columns and vaults covered with reddish and grey hieroglyphics of the northern life – how noble such combination of colours must have appeared to the eye! Several lines of the paintings could have dispensed with pages upon pages of guesses; some detail left by the painter perhaps even subconsciously might have shed light upon a broad range of life in the North and certainly in the ancient Rus'. Significance of such a temple might have surpassed the famous Bayeux Tapestry. Instead, what we have now is just the whiteness of the walls and the fear that priceless art was not only replastered, but possibly even effaced forever.